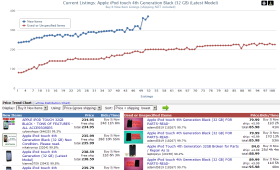 ItemPricer allows you to get comparative pricing information for the items you are selling based on eBay product search. If no product is associated with your listing then it does a similar items search. You are able to look at all of your items and see how many others are out there and the average prices for them. You can also quickly pull up comparison charts with detailed information about your competition. Easily change your item price right from the application. Note: This application works best for popular products such as books, movies, ipods, etc… It doesn’t work so well for unique items like antiques. It can still save you time since it automatically searches for similar items, but this may or may not be useful depending on what you are selling. Please feel free to try out the trial and check it out for yourself. Let us know if you have any questions.